“Then Jesus again spoke to them, saying, ‘I am the Light of the world; he who follows Me will not walk in the darkness, but will have the Light of life’” (John 8:12). “I have come as Light into the world, so that everyone who believes in Me will not remain in darkness.” (John 12:46). “For God, who said, ‘Light shall shine out of darkness,’ is the One who has shone in our hearts to give the Light of the knowledge of the glory of God in the face of Christ (2 Corinthians 4:6). “While I am in the world, I am the Light of the world” (John 9:5). Did you catch it? “While I am in the world . . .” What happened when He left? It’s quite simple. He left the work He had begun of illuminating hearts with the light of God’s character of love to be finished by those who believed in the love He was revealing—us. Again, how we act, how we treat others, will, either for the good or for the bad, directly influence what others think about God. “You are the light of the world” (Matthew 5:14, emphasis added). “A great sign appeared in heaven: a woman clothed with the sun, and the moon under her feet, and on her head a crown of twelve stars” (Revelation 12:1, In the book of Revelation God’s people are wreathed in the familiar sources we know as light). Whether for better or for worse, those who claim to be God’s people will always color the perceptions of others as to what God is truly like. It was for this reason that Jesus prayed for us so intently at the end of His life here: “I pray for them; I am not praying for the world but for those whom you have given me, because they belong to you. All that is mine is yours, and what is yours is mine; and through them is my glory revealed” (John 17:9). Thoughts worthy of meditating on for sure. This next week, let’s mix things up a bit and show the world that God is love. The Father loves the Son and has given all things into His hand—John 3:35.”In the light of the Saviour’s life, the hearts of all, even from the Creator to the prince of darkness, are revealed. Satan has represented God as selfish and oppressive, as claiming all, and giving nothing, as requiring the service of His creatures for His own glory, and making no sacrifice for their good. But the gift of Christ reveals the Father’s heart . . . It declares that while God’s hatred of sin is as strong as death, His love for the sinner is stronger than death. Having undertaken our redemption, He will spare nothing, however dear, which is necessary to the completion of His work. No truth essential to our salvation is withheld, no miracle of mercy is neglected, no divine agency is left unemployed. Favor is heaped upon favor, gift upon gift. The whole treasury of heaven is open to those He seeks to save. Having collected the riches of the universe, and laid open the resources of infinite power, He gives them all into the hands of Christ, and says, “All these are for man. Use these gifts to convince him that there is no love greater than Mine in earth or heaven” (White, The Desire of Ages, p. 57). Could it really be this simple? The primary point of the incarnation (and theologians tend to make it way more complicated) was that it was simply one giant gift for the purpose of proving to us that what was really in the heart of the Ruler of the Universe toward us was one thing and one thing only—the greatest Love ever to be in existence. 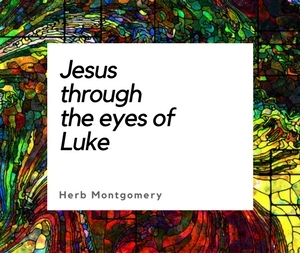 In my mind’s eye, I begin to see the Father behind the scenes of every event of Jesus’ life, enabling, devising, orchestrating—moment by moment—situations for just this purpose: to show us His love. Every act of mercy, touch of healing, or word of kindness, everything Jesus gave, had first been given to Him by the Father for us. So much so that at the end of Jesus’ life He could say with confidence, “I have made you known on the earth; I have finished the work that you have given me to do” (John 17:4). It is said that if you really want to get to know someone, look at how they act when they think no one is watching. Actions truly reveal what is in a person’s heart toward you as nothing else can. I want to encourage you this week to take some time to go back over some of your favorite events in Jesus’ life and, instead of this time thinking of what they reveal about Jesus, let your heart wander beyond all of that to see what type of person the Father must be as well. Jesus answered, “Truly, truly, I say to you, unless one is born of water and the Spirit he cannot enter into the kingdom of God. That which is born of the flesh is flesh, and that which is born of the Spirit is spirit.” John 3.5-6Born of water and the Spirit? What’s interesting to me is that we usually associate this verse immediately with baptism, but I believe Jesus may have been trying to make a much deeper point. Follow closely—in the first few verses of the Bible, there is some very interesting language used. The earth itself was born from the Spirit moving over the surface of the waters. At that moment, God cried out, “Let there be light.” Over and over, Jesus used this imagery of light shining in the darkness. The darkness is all of our darkened misapprehensions and misconceptions of God and what type of God we perceive Him to be. It’s the lies we have been told and that we have believed concerning Him and His character. The light, on the other hand, is the truth concerning God’s character of love as revealed through the life, death, and resurrection of Jesus, God’s Son. It is at the moment when the Spirit is hovering once again over the “waters” of our heart, which is without form and void, that God cries out, “Let there be light.” But it’s not literal light, like we see emanating from a light bulb. It’s the revelation of God’s love for us, shining from the life and death of Jesus Himself, in contrast to the darkness of lies we have believed about Him. When we are “born” of this experience, born of “water and Spirit”, we cease to be simply born of the flesh, conceived of human design and origin. We become born now of the Spirit, of this new revelation of God and the truth regarding His character. Naturally, we are of the flesh—very selfish, very self-centered. But to be born of the Spirit, to be born from a revelation of God and the truth of His love, radically changes us from the inside out. It transforms and converts us from being selfish to “no longer living for ourselves but for Him who died for us and rose again.” 2 Corinthians 5:14,15. Love has awakened love. Something to ponder this week: being born again is much more than just saying a sinner’s prayer or taking a giant bath in the front of some church. It’s a radical orientation shift that comes through encountering God for who He really is.